SEO for Images is Back! It’s back! Anthony Muller, SEO Industry Genius, convinced Google to reveal their traffic data for images. What the results show is incredibly pleasing to SEO… Image Search has returned. SEO (Search Engine Optimization) for images is the practice of optimizing all attributes associated with Images. Some of these include file name, file size, alt attributes, descriptions, structured data, and more. All these attributes play a vital role when it comes to the visibility of images showing up in search engines. 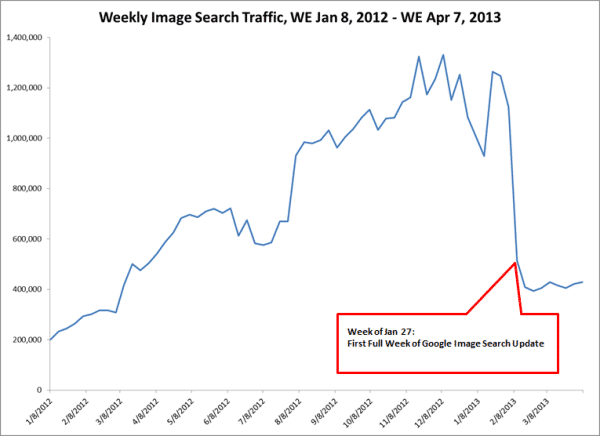 In January 2013, image traffic took a big hit when Google added the “view image” button. The SEO industry complained of traffic losses that occurred across multiple verticals. The loss of traffic was due to people searching, then clicking on the “view image” button and being sent only to the page that houses the image. In short, the image’s direct url. The user has nowhere to go from here. There is nothing to click on, and they are not on the site, they are just left on the image until they click back or enter a different url in their browser. Fast forward 3 years to 2016, and we have Getty Images filing an anti-competition complaint with the EC (European Commision) against Google. The complaint notated that Google was using Getty images in such a way that it was diverting searchers from the Getty website. In 2018, Valentine’s Day, Google reversed their decision and removed the “view image” button from their SERP. According to a Google Search Liaison, this was confirmed as part of their settlement with Getty. Less than 3 months after Google reverting their button on images, traffic data from Google Images has increased. Over 58 different websites from a study done by Search Engine Land, the average increase in clicks from Google Image Search was 37 percent. This increase in traffic from the “new” image search is, of course, leading eCommerce websites to increased conversions. Can sites that lost a large amount of traffic ever make it back? Research shows that websites who lost 70 percent or more of their traffic from image search in 2013 are not seeing the same increases. This could be due to other search engines that still utilize the “view image” button, such as Bing or DuckDuckGo. If you haven’t already, start optimizing your images. If you have a website and don’t know how, or don’t have the time, to properly optimize your website’s images, give us a call or shoot us a message. We’re happy to help you get your traffic back!